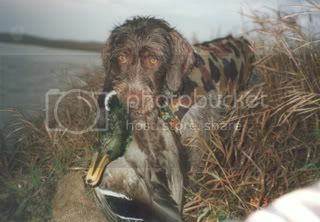 We had to say good-bye to our first hunting dog on Jan 2, 2009 at 12.5 years old. 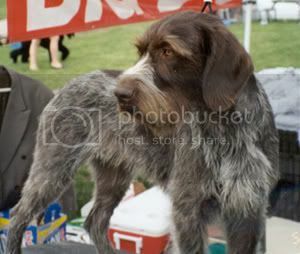 Mom to 10 great pups: 5 NAVHDA NA Pups, 2 UT Prize 1 dogs and one when on to be the only GWP NAVHDA VC and AKC bench Champion. No pics in the field since there were always bad - she's always under a tree fallen tree, or in cattails above her head, or in corn, or just a blur. We even had a professional photographer come with once, that's where we got the blur...she found pheasants in a horse pasture on the edge of Minneapolis where no wild birds should have been. We always ran her last since she would find anything out there, mopping up the birds the other dogs missed wherever they may be. Best cripple dog ever. She taught me why people hunt - she usually chose to hunt with me even when it would have been more fun for her to be by over Mark. 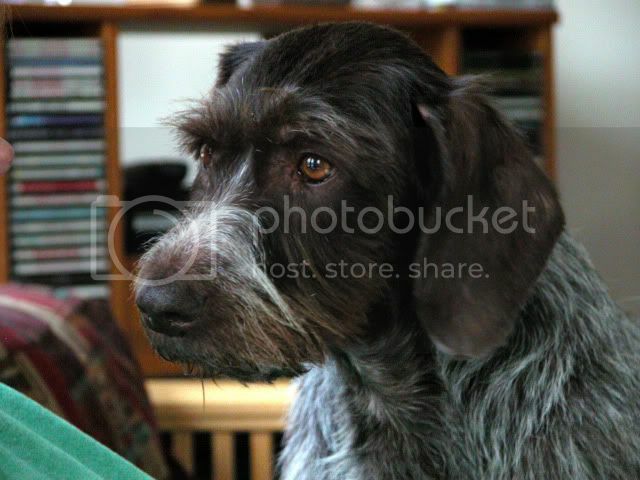 She was a great little GWP. Last edited by Deb on Sun Jan 25, 2009 11:42 am, edited 2 times in total. - charming the audience at the MN State Fair by walking slowly down the line of bleachers intently searching crowd for Mark to complete her retrieve when the trainer running the demonstration told her to 'fetch'. The crowd mobbed her at the end when Mark had her do a sit & stay while he took the dummy to the trainer. When I worked my way through the mob of people about 10 deep, she was stilling sitting in the same spot with two women kneeing on the ground hugging & kissing her. In the field or blind she was all business otherwise she was full of good-natured mischief - both sides of Oakley have supplied us with many great memories. Enjoy the time with your dogs - the great, the good, & the less than perfect - it goes by too fast. Sorry to hear about yours and Marks loss. Oakley was a nice dog. So sorry for your loss, sounds like a dog that lived well, I would have loved to be a fly on the wall when the dogs saw that fox! If it doesn't have a beard, it's not a whole dog! Sorry for your loss. Great pics and memories.